This Archipelago is a living museum of evolutionary changes. Free and fearless animal, different from any others found elsewhere, make visitors wonder about their very existence on our planet. 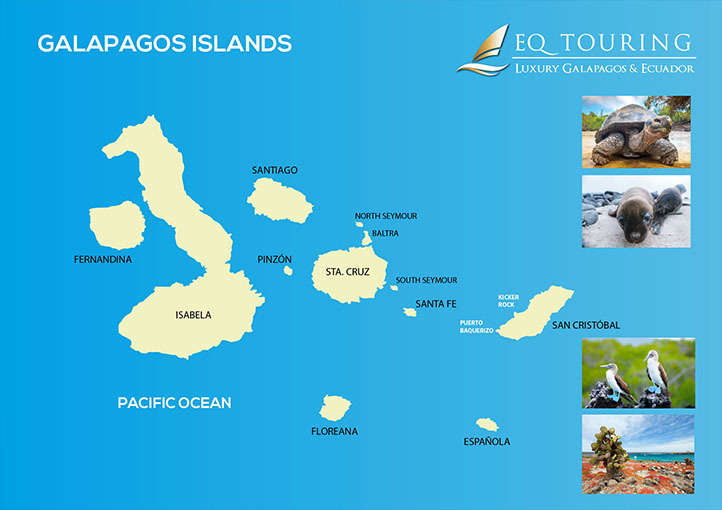 The UNESCO declared Galapagos as a World Natural Heritage Site in 1978 and subsequently a World Biosphere Reserve in 1985. Among the animals found are the different species of giant Galapagos tortoises that gave the islands their name due to the similarity of their carapaces to a British riding saddle called Galapagos in Spanish. A very big variety of birds are found here, like blue footed, red footed and masked boobies, flamingos, frigate birds, albatrosses, unique small penguins and non-flying cormorants and 14 different species of finches. These various species of finches served as proof of Darwin’s theory f evolution for natural selection. Marine mammals such as sea lions, dolphins and whales are also found; as well as multitudinous colorful fishes. The most distinctive plants are mangroves and endemic cacti. The Galapagos Islands house an incredibly high rate of endemic species. In 1835, Charles Darwin sailed on the British ship H.M.S Beagle and visited the islands. His writings on the theory of the origin of species, which shook up the scientific world, were inspired by the living proof that he found in this unique volcanic Archipelago. The islands are located 600 miles from the Ecuadorian Coast. In 1936, they were declared a National Park to preserve the flora and fauna of the 13 large islands, 6 minor ones and more than 40 islets. The origin of the Galapagos Islands is volcanic. The islands appear from lava eruptions that came from the bottom of the ocean and that rise as much as 2.600 ft. above sea level. Lava from more than 2.000 craters has continuously altered the terrain of the region. In 1959 the Government , along with the Charles Darwin Foundation, UNESCO and other international scientific organizations, established a biological research station on the islands. All tours take you to a visit of the Station. Scientist greet visitors while they instruct on the marvels of the islands. NOTE: The biggest problem affecting the biodiversity of the Archipelago is the introduction of species of animals and plants that are a big threat to the native and endemic species of the islands. The interior waters of the Galapagos Islands, plus those within 40 nautical miles measured from the baseline of the Archipelago, were declared the Galapagos Marine Reserve on 1994. This is the only protected coastal marine area in the east Pacific, and the second largest Marine Reserve in the World. It holds approximately 51.351 square miles of the interior waters of the Archipelago. There are many areas with small submarine volcanoes, which are important feeding zones for marine birds and mammals. The submarine area of Galapagos (0 to 590 ft. deep) is of 2.587 square miles. Do not miss the chance to snorkel with sea lions, penguins, a variety of colorful fish and even inoffensive sharks. Diving tours are offered for those who are willing to take a deep adventure.